Apple’s Peloton patent describes a group of self-driving electric cars sharing battery power through a connecting arm. Apple received a patent on Tuesday for a suite of autonomous vehicle technologies that it’s calling Peloton. A lowercase-P peloton (for those of us who aren’t Carfection’s Henry Catchpole) is a pack of bicyclists riding together, often to help share wind resistance and make the group more efficient. 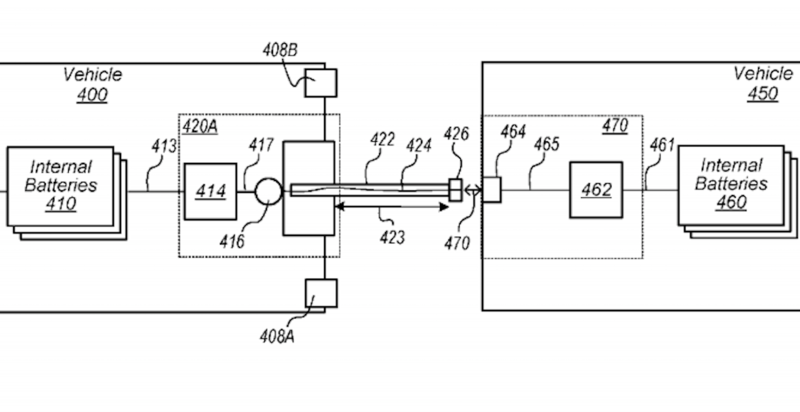 A big part of Apple’s Peloton patent involves autonomous cars using a “connector arm” to physically contact the vehicles in front of and behind them to share battery power. Think mama elephant and baby elephant — or Human Centipede, if you’re gross. Apple says that its Peloton technology could be used with as few as two self-driving cars, but with more vehicles sharing wind resistance and battery power, the more efficient the group becomes. This takes the idea of self-driving vehicles platooning to a whole new level. In a Peloton group, the lead vehicle would be the “ego-vehicle,” and it would effectively control the cars in line behind it. One of the problems with an interconnected train of self-driving vehicles is of course that not everyone in the Peloton would be going to the same destination. Apple has a solution for this whereby the vehicles would communicate with one another and organize the Peloton based on each car’s distance to its destination. We’d be surprised if Apple’s efforts in the autonomous vehicle space ended up with it producing its own vehicle for sale to the public. Instead, we’re guessing that it will license its technology to existing vehicle manufacturers, much like it does with Apple CarPlay.